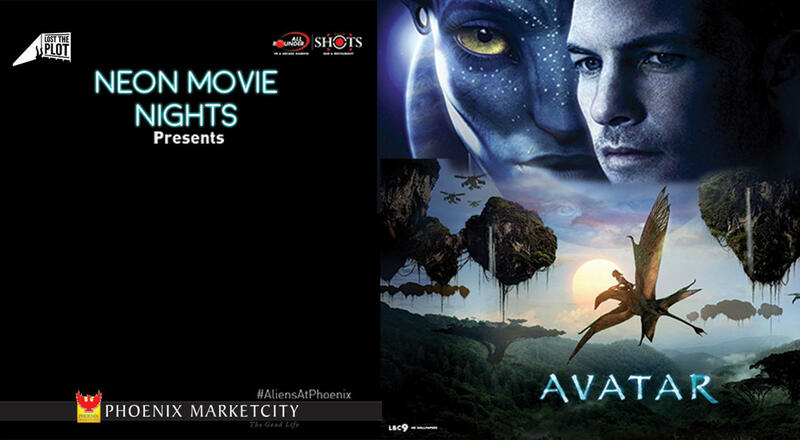 Phoenix Market City in association with Lost The Plot presents a brand new, unique cinema experience - Neon Movie Nights. Join us at All Rounder Shots on Sept 15th for a mesmerising UV themed immersive screening of Avatar - where you will not just watch, but live the film! James Cameron’s visually breathtaking odyssey Avatar is the captivating tale of Jake Sully, a paraplegic former Marine, that finds himself on Pandora helping the Avatar Program acquire the element ubatonium for a severely depleted Earth. Assuming their “avatar” (human hybrid form) the team find themselves on Pandora where things go awry right from the start. And what follows is the single most absorbing film experience that still hasn’t been surpassed nine years later. Unafraid of the enormity of his vision, Cameron has carved a world that is so rich in detail and imagery, strengthened by a simple yet powerful story. This one definitely needs to be relived on the big screen with your friends and family.